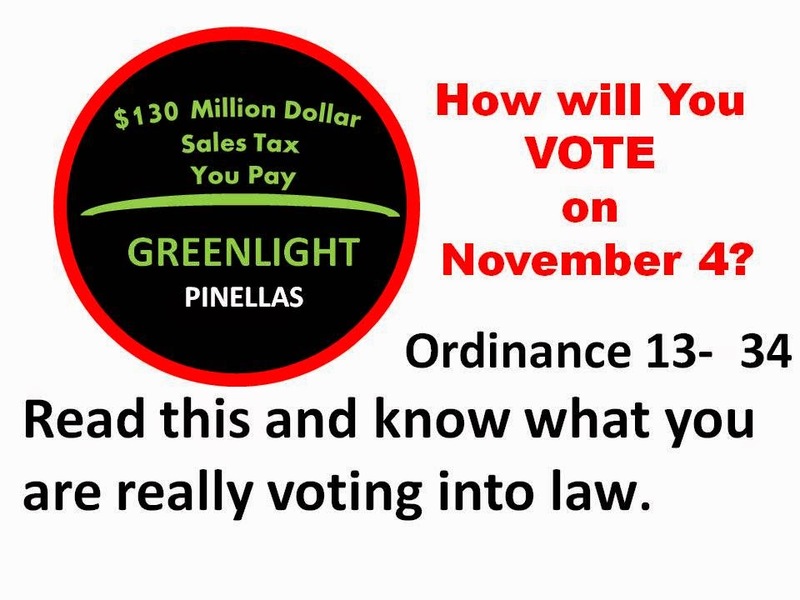 For your convenience here is the entire Sales Tax Ordinance 13- 34 with comments from all 12 of my previous Posts. IMPOSITION OF THE SURTAX; PROVIDING A BALLOT TITLE AND SUMMARY OF THE PROPOSED REFERENDUM QUESTION; PROVIDING FOR NOTICE OF THE REFERENDUM ELECTION; PROVIDING FOR NOTICE TO BE GIVEN TO THE DEPARTMENT OF REVENUE; PROVIDING FOR INCLUSION IN THE PINELLAS COUNTY CODE; PROVIDING FOR SEVERABILITY; PROVIDING AN EFFECTIVE DATE. In this Whereas, the circular logic of pervious three Whereas clauses are now assumed to be in your best interest and a totally valid reason for you to accept the necessity to fund an undetermined plan and one or more to be determined interlocal agreements, and obligation bonds to build an undefined transportation system for which you will pay $130 Million per year for a to be determined period of time.